The Messerschmitt 262 was the first jet fighter in the world to enter squadron service, towards the end of 1944, having taken six years to develop. The fighter version was the ME262-1a Schwalbe (swallow); a second version was the ME262A-2a Sturmvogel, adapted as a fighter bomber. 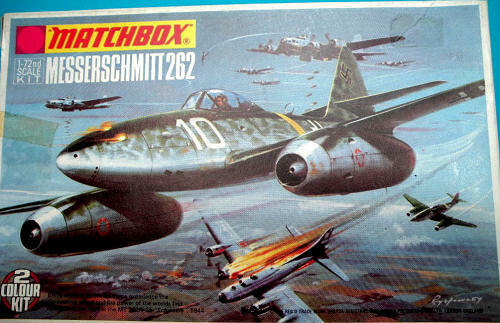 Matchbox’s version of this famous jet is cleanly molded in 38 gray and green plastic parts and a clear one piece canopy. The surface is a combination of engraved and raised panel lines that shows some appreciated restraint and should look very good after the paint has been applied. A very basic cockpit consists of a very well done pilot figure attached to a seat shape that is then attached to the featureless cockpit. While this may sound negative, the fact that with the canopy attached this is more then adequate to occupy the very small pilot opening. While all the landing gear wells are framed in, the main ones in fact should be open to the bottom of the cockpit tub while the nose bay is way too shallow. Though again, only an issue if the model is picked up so that the bottom can be viewed. A plus is the fact that the main gear doors have a raised interior face, but these feature both ejection pin marks and the raised part number, plus they are too thick. Correcting these issues simple requires sanding both surfaces a little thinner and that can be done in short order. Finishing off the gear are the thin struts with the main members including the side retraction arm in place and all the tires have nicely done detail on their wheels. As this kit is offered as the fighter or bomber, the nose mounted bombs are included with their stream lined pylons. Last details of note is that there are both inlet and outlet faces to go into the engine pods. The latter feature the access panels as well done engraved lines while the numerous outlets on the aft pods are there and look good. Assembly is fully covered in seven well drawn steps with Matchbox offering the detail colors notes at the end. 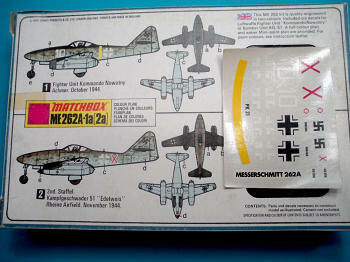 Both decal options are illustrated in full color on the back of the box. White 10 is from the Fighter Unit Kommando Nowothy that has a yellow fuselage band and according to the painting instructions RLM 02 engine intakes. The second option is a bomber from the 2nd Staffel, Kampfgeswader 51 “Edelweis” with the dash of color being the red fuselage X that features white piping. Surprisingly, the kit decals still look good and some basic stenciling and the yellow fuselage band is included besides the full national insignia. 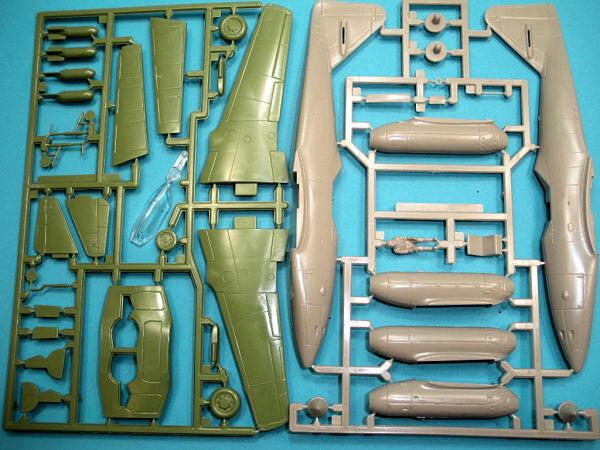 Actually, I am somewhat impressed with what is in the box with the outline looking good and the engine pod detail worthy of note. A great quick build alternative to the better Hasegawa and Academy kits (not sure how good the Jo-Han kit is).